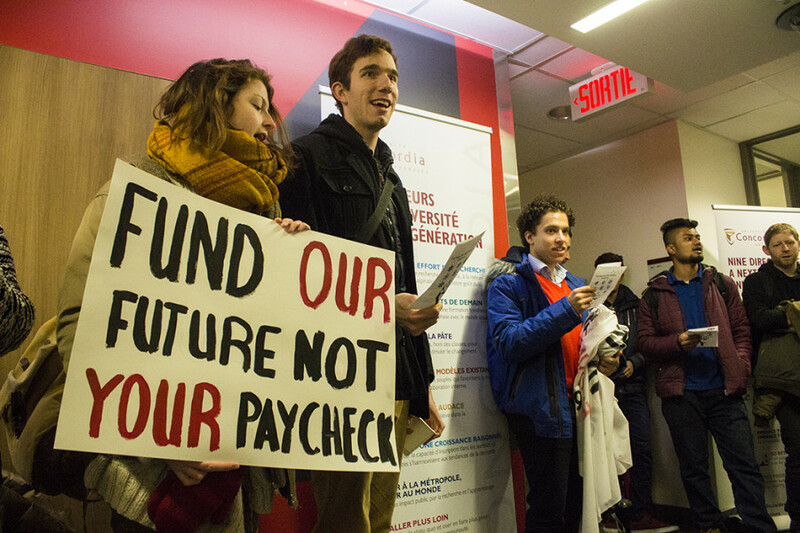 The Concordia Board of Governors failed to implement cohort pricing for future international undergraduate students in deregulated programs on Wednesday afternoon, after student-protesters delayed and caused the meeting to relocate. The final vote count was 12 in favour, six against, and three abstentions, according to Norman Hébert Jr., the chair of the Board of Governors. The Board is the highest decision-making body at the university. “I thought it was a good proposition and I’m disappointed,” said Concordia President Alan Shepard in an interview after the meeting. To pass the motion, the Board needed a 60 per cent majority. The proposal for cohort pricing stipulated that incoming international students in the deregulated programs of engineering, computer science, mathematics, and pure sciences would experience tuition raises of seven to nine per cent based off current rates. These students would pay the same rate for the duration of their degree, defined as four years for 120 credits. Concordia spokesperson Chris Mota previously explained to The Link that if a student were to change programs or take longer than four years, their tuition would remain that of their initial cohort, with some exceptions. Students had been protesting since about 3 p.m, with banners and signs painted with “Stop the Hikes” and other slogans, beginning in the lobby of the EV building. 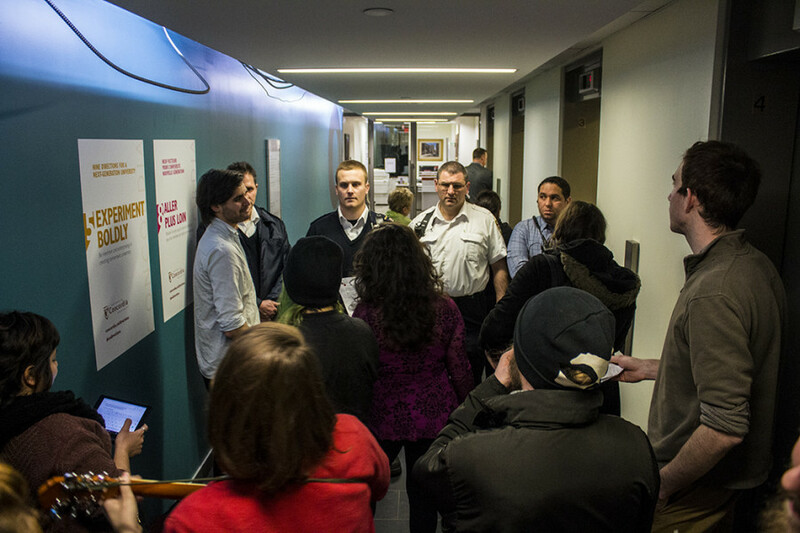 They sang anti-hike chants to the tune of holiday songs, such as “O Dreidel” becoming “O Shepard.” About five students had made it up to be 4th floor of the GM building, succeeding in keeping governors from entering the meeting room. Concordia security confirmed that about a dozen guards—their regular team—were placed throughout the building, trying to stop protesters from accessing the floors on which the Governors would be meeting. They discontinued service of the elevators, and had locked the doors of the stairwell on the 4th and 9th floor. After pushing past security, and finding one stairwell that was not blocked, protesters made their way onto both floors—first the 4th and then the 9th, where chanting continued. Just past 4 p.m, at which point the meeting was supposed to start, it was confirmed that there would be no live stream in the observer’s room, located in MB-1.210. This means that the open session BoG meeting would not be viewable to anyone outside of the room, including press. News came from Concordia Student Union General Coordinator Lucinda Marshall-Kiparissis, who is also the undergraduate representative on the Board, that the motion had failed around 5:30 p.m. Marshall-Kiparissis could not be reached for further comment on what happened in the meeting by press time. 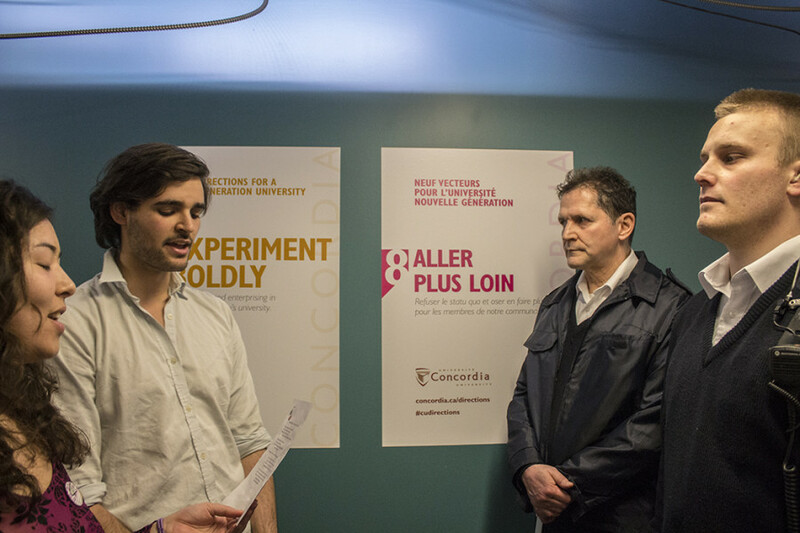 On Friday, students tried to bring up their concerns regarding cohort pricing at the Concordia Senate meeting, but their questions went unanswered. Mobilization against the now failed pricing system began about a month ago, when CSU leaders accused the university administration of not being transparent about the process.